We have a home again. This is no small matter. Since June 28th, when we moved out of our apartment in Al Ain, we have changed locations 15 times. From friend’s homes to hotels to airbnb apartments to basement suites, our move into our townhouse marks move number 16, and as you can imagine, we are all more than ready to unpack our suitcases. But how did we get from planning on RV or tiny home living to buying a townhouse? Well, the bottom line is that purchasing one of these options was totally doable, but finding a place to put it was another matter. I thought this would be easier than it was, but with the BC housing market being so crazy, the out-of-the-box affordable living options have also been all snatched up. 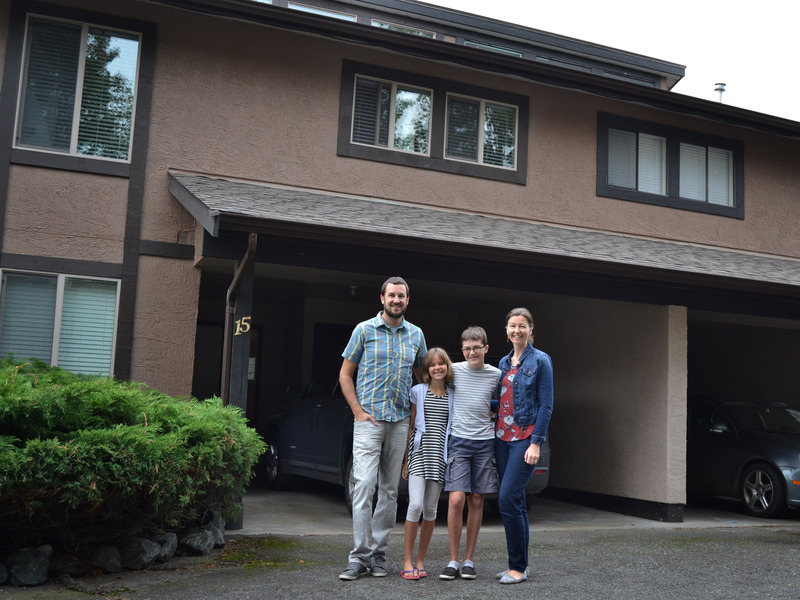 And setting up house on someone else’s property in Chilliwack turned out to be more complicated than we’d expected, and in the end, not really suitable for what our family needs in this season. So, it turns out we have returned to a much more mainstream living situation than I had been dreaming of recently. However, thanks to generous family and as always, the perfect provision of God, we now find ourselves with lower mortgage payments than what it would have cost to rent an RV pad every month. You guys, it’s so perfect for us! All 4 of us. Remember I was telling you about all the things we worked through this summer about what we really needed and didn’t need in order to really thrive and serve? Well, this home far exceeds what anyone in the world really “needs” to live in, but in God’s wonderfully gracious way, it meets everything that each of us hoped for in a living space. Three small bedrooms, big living spaces for family and friend time, a tiny yard (we hate yard work), a covered spot for our car, and very little storage space to force us to keep our belongings pared down and simple. AND, it’s a 3 minute walk to Dairy Queen! Thank you Jesus! Do you also remember when we built that beautiful dream home in 2010? It’s hard to compare the feelings we had on that move-in day, as that was a labour of love on so many levels. But here’s the thing: our new-to-us home is beautifully reflective of where we are in our lives now. The complex is almost 40 years old. In fact, it was built the same year that Dwayne was born. But inside it has been marvelously renovated, with all of the colours and finishing I would have chosen if I’d been doing the renos myself. (See – God was saving it for me.) I think this home is a good picture of the Hansen family. We might look the same as always on the outside, but we have returned from a very transformational experience. God has done quite a work in each of us. We are not the same. We have also been remodelled. And I believe God has sent us back to do a new thing. To carve out a different life with a new perspective. So, when I pull up to my lovely dark brown townhouse and walk inside to the fresh new interior, I will remember that God’s greatest work is how he transforms hearts. That he is always willing to do something new in us, if we are open to his prompting. That he created us and knows our longings and our needs better than we know them ourselves. That he is a good, good Father, and I’m loved by him. That’s a lot for a house to say, but I guess it’s a talker. Like me. After that great description not adding some inside pics is a tad cruel 😉 Congratulations!! As realtors, we sure were wondering how your search would play out – considering the changed market conditions you were facing. We hear this all the time: we can’t find the home we are looking for – considering price, location, size, style etc. That’s why we are really happy to hear that you found ‘your nest’!